Details about the rumored Motorola phone code-named "Sholes Tablet," the sequel to the recently released and highly-acclaimed DROID, leaked on a Chinese message board (Google translation). 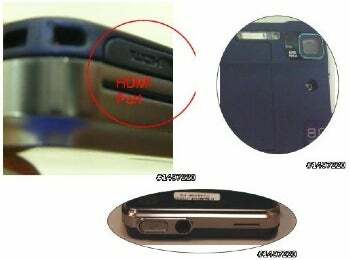 The leaked photos suggest an impressive spec sheet for Motorola's encore, including a 3.7-inch screen and HDMI output. Motorola's DROID, released in October, is by most accounts a solid phone, anchored by its Google Android 2.0 OS and 550MHz processor. However, the DROID, whose codename in development was "Sholes," may be bested by the Sholes Tablet in as soon as a few months. According to the leak, the Sholes Tablet will feature a capacitive 3.7" screen at WVGA resolution with multi-touch support and the same speedy processor powering the DROID. Most impressive, however, is the HDMI port built directly into the phone which will reportedly allow the Sholes Tablet to record and output 720p video. This is made possible by the 8-megapixel camera inlcuded in the new model, a step up from the 5-megapixel camera in the DROID. If these specs are true, your HD video collection may soon go mobile and make your Zune jealous. One notable downgrade, however, is the removal of the sliding QWERTY keyboard. While Android does have support for an on-screen software keyboard, you may want to stick to the DROID if you find yourself writing long emails or editing your memoirs. Otherwise, the Sholes Tablet will have plenty to keep you entertained. Stay on the lookout for an official announcement.